Throwing it back to March 8, 2013…. I just spent some time going over old blogs, and I found some strange and humorous stuff I used to write. Everything feels so serious lately, so I thought I’d pull some of this old stuff out to break up the dredge of darker tone I take these days. This was originally part of a blog called The Writers Room that I kept from July 2009 to July 2013. Have Racism and Sexism Changed? The apparent suicide of Robin Williams is a great tragedy. He was certainly a guy tuned into the collective humour of humanity. He felt things deeply and brought people together in laughter. This is my new blog focused on my writing projects. Unlike previous blogs I’ve done, I won’t be going off on satirical rants or sharing my perspectives on issues, mostly because people take satire too seriously these days and my perspectives are as fleeting as whispers on the wind. I’m tired of the whole faux pundit games people play, so much so that one of my projects is a fictional pundit book taking jabs at my own former seriousness. I plan to share excerpts from my fiction and thoughts about the writing process, giving some insight on where my ideas come from and how ‘fiction’ differs from ‘reality’. The end goal is to complete the two projects currently at the forefront of my writing life, but as a creative writer I know that things don’t always go according to plan. I also know that my books don’t exactly fit a demographic or speak to a particular audience, so they will exist in a sort of no-man’s land—as I imagine this blog will too. I’m good with that. Just more cryptic w(h)it. 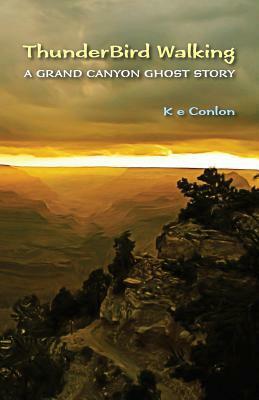 As you might guess by the title, this is a followup to my first novel ThunderBird Walking: A Grand Canyon Ghost Story. I think my first book flew way over people’s heads; I’ve heard little from people I know personally, and the writer’s group I shared excerpts with seemed uncomfortable with it even while understanding the story and praising some of the writing. The silence has been amazing, and I found that there was a lot of talking I wanted to do about all that walking, explaining what the book meant. Robbed of good conversation and a sense of community, I found this book coming to the forefront a great deal sooner than I imagined a sequel to TBW might. So this is my anti-pundit pundit book dumbing down my first novel, mostly for myself. This book is an anthology of short stories that I wrote in creative writing classes back in the 80s with a few new stories written more recently. In addition to these stories, I plan to add thoughts on the craft of creative writing (and specifically the horror genre) as I learned it all those years ago. I cannot fathom how anyone studying the written word in American today can weed through all the apocryphal information on the internet and come to understand the art of writing. Obviously, I never succeeded professionally as a creative writer—my voice being so odd—but revisiting these old stories and having some new ones come to life has been a nice experience, so I wanted to capture that in a book. As a rule of thumb, I might post here about twice a month—maybe a little more in the beginning as I have already completed a chapter of the new novel and the short stories are already written. I’m not much of a moderator so the posts may not allow comments or I may not reply to them. I’m not expecting much traffic here; I hope you get something from this blog if you choose to read it.